The scare articles have been making the rounds (again). A few years ago it was the article claiming essential oils would suddenly cause your child to have seizures. There’s the ever-popular (and false) assertion that lemon oil will eat through your esophagus just like it eats through Styrofoam. This year I’ve seen two Facebook posts circulating about essential oils and pets. One involves an elderly cat, the other a small dog. Both say that the person bought essential oils, diffused them and came home to discover a disorientated, distressed pet. 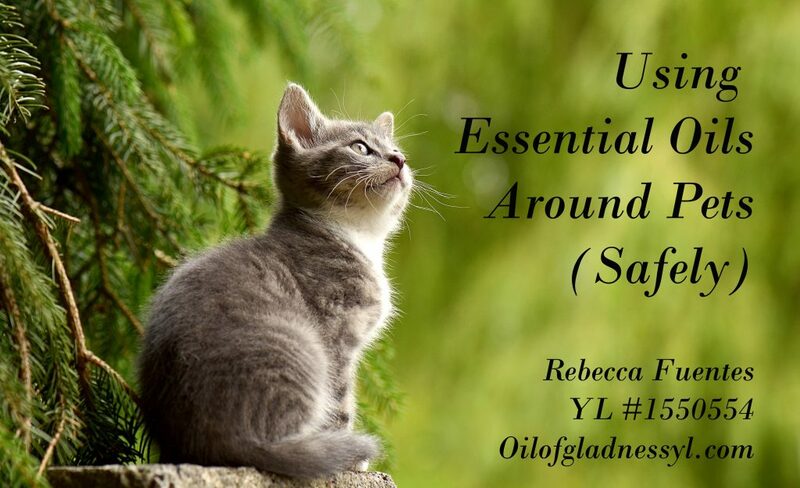 The overall theme of each post is that these essential oils that are so popular are powerful, dangerous items that should never, ever, under any circumstances be used around our precious fur-babies. Yes you CAN use essential oils safely with your pets. On the one hand, they’re right. Please, please, do not go out to Wal-Mart or even Natural Grocers, and buy essential oils off the shelf, then come home, load up your diffuser and leave your pet alone, in a small room, with that running diffuser. If you do that, I will be surprised if your pet doesn’t have a negative reaction to the essential oils. Why? First, because you bought oils of poor quality. These oils have most certainly been enhanced, diluted, and adulterated with any variety of synthetic chemicals to make them cheaper and smell better. Any real essential oil in them came from a questionable source with unregulated distillation methods designed to get the maximum oil out the minimum of plant material. Second, you left your pet alone, with no way to escape, while pumping these into his air. This is a recipe for disaster. Hopefully, no one else out there is doing this. However, I don’t want people to be scared away from using essential oils just because they have pets at home. There are ways to use essential oils safely with your pets. Keep two principles in mind while you do so: go slow and be cautious. Our pets vary in size, sensitivity, metabolism, and their dependence upon us. While some animals find it easy to leave an area, other animals are more confined. Some animals find it easy to communicate with us, while others give much more subtle cues. It is our job to pay attention to our animals and their reactions and adjust our essential oil usage accordingly. First and foremost, quality of essential oils is of primary importance. This goes for any time anyone is using essential oils, but it is even more important for pets because so many of them are small and have much more sensitive systems and metabolisms than humans. What contributes to quality? How the plants were grown–they should be grown without chemical pesticides or fertilizers in clean soil. Anything on or in the plant will be in the oil. The plants must be harvested and distilled properly for the right amount of time at the right temperature. They must be bottled without dilution or contamination–no synthetic smells or extenders. The only company that controls that process from start to finish is Young Living. Second, animals have a much keener sense of smell than humans. Smells that are pleasant or faint to us will be overwhelming to them, especially if it is a new smell. We must respect that! Just like people, pets can have a negative emotional reaction to smells, including essential oils. It’s important to start small and introduce essential oils to pets in the gentlest way possible. Diffusing essential oils in a large room is an excellent way to start. Using just one or two drops, diffuse a new oil and observe your pet. Make sure your pet has a escape route from the room. If your pet leaves or behaves in a strange way while diffusing, shut the diffuser off and air out the room. Look for lethargy, pawing at the nose or face, drooling, nasal discharge, or behavior that is out of the ordinary for your pet. We have a dog, two cats, and two Guinea pigs. We’ve diffused a wide variety of Young Living oils around them over the past four years. None of our animals has shown any negative reactions to diffused oils–even tea tree or eucalyptus (the oils in the Facebook posts that did their rounds). In fact, over Christmas and through January, I was diffusing eucalyptus around the clock in my bedroom, along with lemon, tea tree, spruce, copaiba, and frankincense. I spent a lot of time sitting in my rocking chair with the diffuser less than 18″ away. What did my pets do? The cats would come spend an hour or two snuggled on my lap, right next to that diffuser. My dog would lay right on my feet, just a few feet from that diffuser. None exhibited any signs of irritation, confusion, or health problems from hanging out by my diffuser. However (and this is important), they all had the freedom to leave the area at any time. At no time were they trapped in the room with the diffuser. What about topical usage? Yes, some essential oils can be used safely on certain animals. I’ll be honest, in most cases, I am not going to apply essential oils directly to my animals. On some occasions, I’ve found it necessary. Just like diffusing, using essential oils topically requires caution and a willingness to go slowly. First, if you use products containing petrochemicals on pets, there can be a skin reaction to essential oils. This is the oils reacting with chemical residue on the skin. It’s a good reason to seek out safe pet care products that don’t contain damaging petrochemical products, aluminum compounds, artificial colors, parabens, or propylene glycol. Some of these might be safe for humans, but are not safe for pets. To use oils topically, dilute, dilute, dilute. The smaller the animal, the more dilution is needed. The denser the animal’s coat, the more dilution is needed. Denser coats mean more hair follicles, which means oils will be absorbed more quickly. For small animals such as cats, small dogs, and pocket pets, dilute one drop of essential oil with 10 drops of carrier oil, at least! For very small animals (puppies, kittens, smaller pocket pets), dilute on drop of essential oil in 30 drops of carrier oil–that’s one drop of essential oil in 1/2 tsp of carrier oil. Pure, therapeutic quality essential oils are powerful. They will still be effective when diluted. Large dogs and large livestock animals such as goats, pigs, sheep, and small ponies can have essential oils diluted 50-50, that is, one drop essential oil with one drop of carrier oil. Some very gentle oils, such a frankincense, copaiba or lavender can be used neat on these animals. Very large animals, such as cattle and horses can use oils neat, so long as the oils aren’t hot. Hot oils must always be diluted–these include cinnamon, clove, oregano, basil, thyme, and lemongrass, as well as blends which include these. Essential oils can be safe and effective on pets. However, we wouldn’t buy an OTC medicine of unknown ingredients and origin and use it on our pets without reading the directions. In the same way, it’s important to do some research and start using oils on pets with some caution and common sense: use quality oils, start small, keep an eye out for negative reactions, give an escape route, and dilute the oils!